We welcome you to the Perennial Garden. 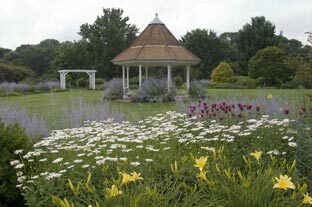 Originally established in 1976 as a lilac collection, these five acres have evolved into a garden that provides year-round interest and color for bridal parties, as well as the general public. In spring, the garden comes alive with the colors and fragrances of daffodils, lilacs, daphnes and pinks. Late spring and summer bring added color and form to the garden. 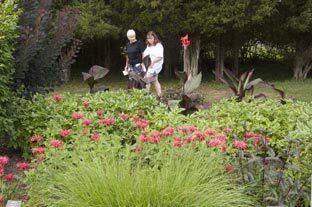 Irises, peonies, roses, lilies, and coreopsis bloom among the many perennials and shrubs. In autumn, asters, ornamental grasses and butterfly bushes reach their peak bloom. Evergreens and winterberry hollies provide interest well into the winter months. Amid green lawns and beds of colorful perennials, bulbs, trees, and shrubs, lies the focal point of the garden, the gazebo. It was constructed in 1986 by donations from the Friends of Horticulture, Inc. The public can reserve the garden for wedding ceremonies and pictures, and other special events. 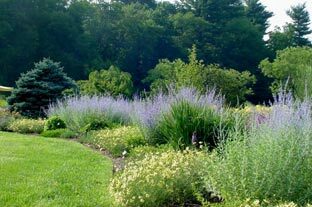 The Perennial Garden is part of a more extensive Arboretum, which includes the Fragrance and Sensory Garden, the Ornamental Grass Collection, the Rudolf W. van der Goot Rose Garden and the Shrub Collection. Wedding ceremonies and pictures, and other special events by permit only. Please call 908 722-1200 ext. 5721.